clean and cut Gobi , Broccoli into florets. Boil the florettes for 10 minutes in water (filled above the florets) with 1/2 tsp salt. Drain water.In a dish mix all the above dry ingredients. Add rest of the batter ingredients with water & mix well. Mix it to thick paste. Add Gobi & Broccoli florets mix well. 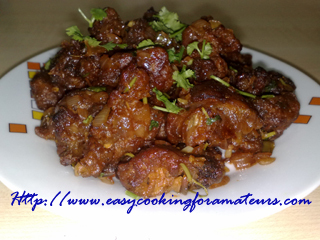 Note: This can also be served as pakoda without preparing sauce, as we have added spice ingredients to it. Add onion & 1/4tsp salt (add salt cook onion fast) fry. Add chillies, ginger, garlic & fry till garlic raw smell goes & onion is light brown. Add vinegar, soya sauce, chilly sauce & tomato sauce stir well. Add chilly powder, coriander powder, chat masala stir. Add fried gobi & broccoli stir well for 2min.